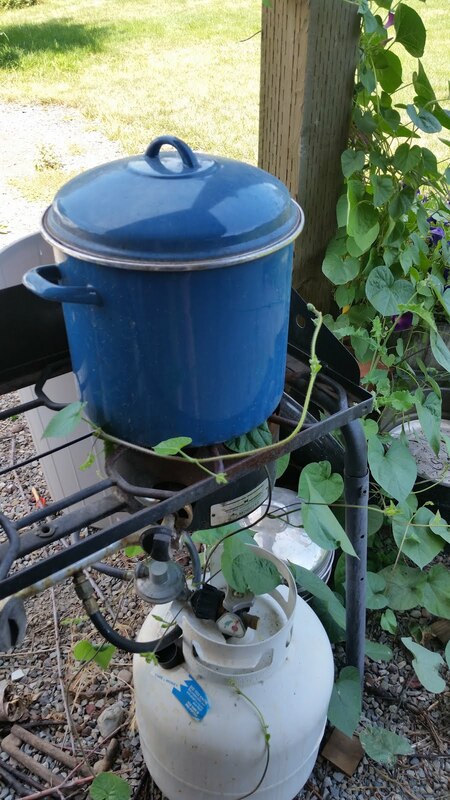 When vines start growing up around the steam pot it is a sign one has been out of the studio for too long. 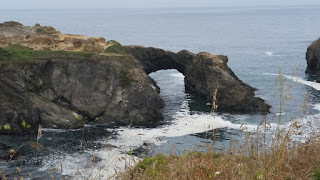 I am here at the Mendocino Arts Center waiting for the show to begin. We had a lovely day at the beach and exploring galleries yesterday and now the work begins. The art center is so beautiful and inspiring, it is sure to be a good day! Today was International Happy Turkey Day at our house. Never heard of it? Neither had I. Turns out, this day is celebrated on the first Wednesday after the 4th of July. Mama turkey arrives in your yard the day before you are supposed to leave for a show in California. I guess tradition holds that once she and her babies arrive, all productive work ceases. Pots boil dry on the stove, laundry molds in the washer etc. This is so that you and any other humans around the place can stand on the deck, or behind trees or sneak around the bird bath to try to observe the turkeys, well, being turkeys. Part of the tradition is also trying to count the number of babies (4) while burning up your phone battery taking grainy motion shots of Mom turkey and her wee ones diving in and out of the perennial border. Turkeys are apparently very camera shy. I ended up way behind on the watering schedule for the yard, as I really didn't want to turn the sprinklers on the baby turkeys. They left, I turned on the sprinklers, and here they were back again! As hot as it is, it is no wonder. I felt like scratching a dip in the ground and sitting in the spray myself. Later on I went to water flower pots in the front yard and they were out there, heading off to neighbor Neal's to have a bit of chicken scratch before bed I suppose. I can't imagine what Neal's domestic girls think of their wild cousins inviting themselves to dinner. The best surprise was the gift I received tonight. 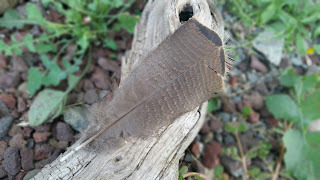 I went out to the garden to get squash and onions for our dinner, and discovered mom turkey had left a small feather. The most startling thing about a wild turkey is how big they are, not their coloring. But this feather has the most beautiful subtle shades of grays, browns and tans with small bits of olive green thrown in. I wish I could draw it, but this photo will have to do. Well, ready or not, I am off to California to visit friends, see galleries and then do the show at Mendocino the 18th and 19th-hope to see you there!